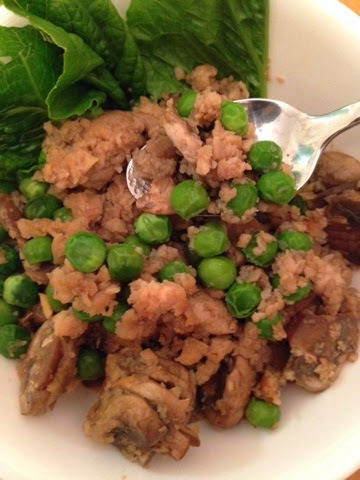 Grain Free Spicy Mushroom Pea Risotto. Ok, so I have a confession...I've never actually had risotto before. And risotto is not necessarily what this dish was supposed to be! But I kept adding ingredients as I went (totally FUN if you've never done it before!) and ended up with this risotto-like yummy dish. Quick and easy as usual and nice and spicy. Hope you enjoy! 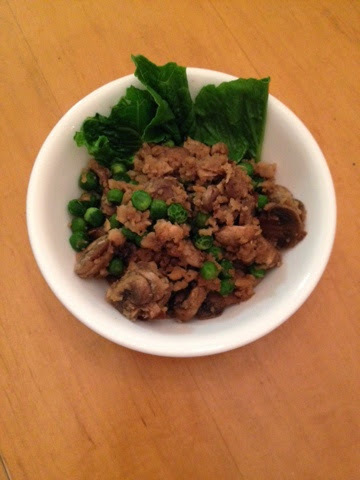 Grain Free Spicy Mushroom Pea Risotto; Vegan, Gluten-free. Serves one. 1. In a medium microwaveable bowl, combine TVP and water and microwave for one minute on high. Set aside. 2. In a non stick skillet, eat the liquid aminos and sauté mushrooms and peas for about 2-3 minutes until mushrooms begin to exude their juices. Add spices and fold in. 3. Add now cooked TVP and a splash of water. If you want to add more chipotle spices, add it here. Fold in and cook for about 4 minutes, until liquid is absorbed. 4. Transfer to a serving bowl, garnish with lettuce, and enjoy! 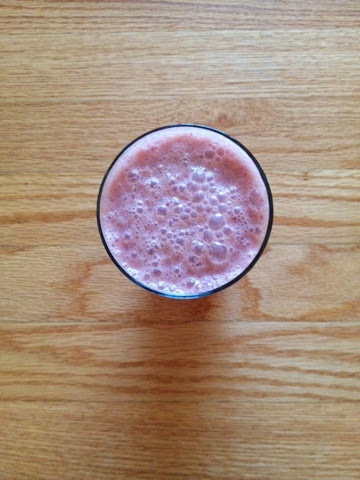 This Raspberry Lemonade Smoothie is a perfect refreshing summer treat! Tangy and frosty frozen raspberries mixed with zesty fresh lemon juice and just the slightest touch of sweet. Poolside drinks, anyone?! 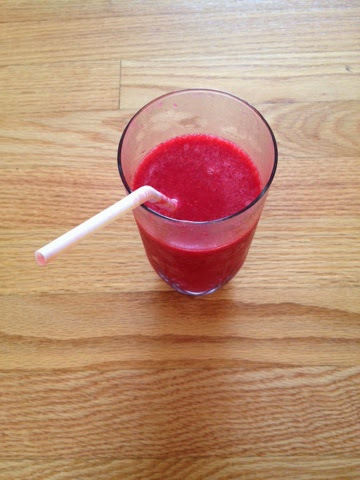 Raspberry Lemonade Smoothie; Vegan, Gluten-free. Serves one. 1. Add all ingredients to your vitamix or other high speed blender and blend until smooth. Pour jn to a tall glass and enjoy! Frosty and delish. This. Is. So. Good. People. Thick, creamy, and so easy to make, this will for sure be a new favorite for you...it is do me! 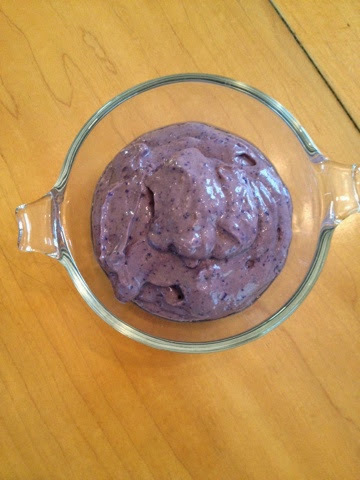 Blueberry-Carob Mousse; Vegan, Gluten-free. Serves one. 1. Combine all ingredients in your mini food processor and blend until smooth, scraping sides as you go if needed. Serve! NOMS. These Protein-packed Breakfast Oat Cakes are a good filling breakfast option for when you have a bit more time in the morning. Warm and delicious, these cookie-like oat cakes go perfectly with banana nice cream! 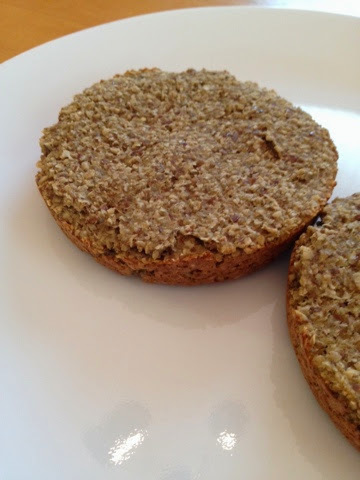 Protein-packed Breakfast Oat Cakes; Vegan, Gluten-free. Makes one serving (2 small cakes). 1. 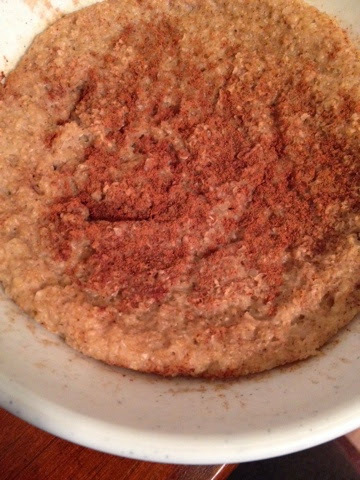 In a medium size bowl, mix together the oatbran, protein powder, flaxseeds, stevia, and cinnamon. Add applesauce and water and stir. 2. Spoon batter into two non stick mini baking pans. Bake at 350 F for 20 minutes. Let cool before removing. Enjoy! I just love comig up with new veggie sauces. The combination possibilities are endless. 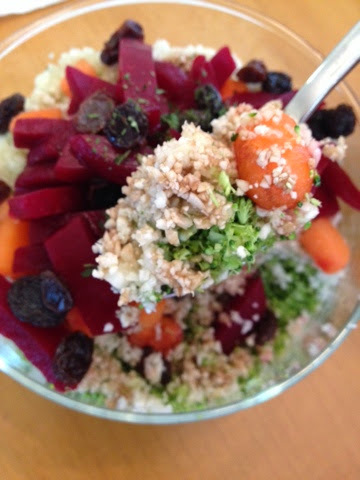 This sauce was born from beets that needed to be used PRONTO and my fave veggie...carrots! 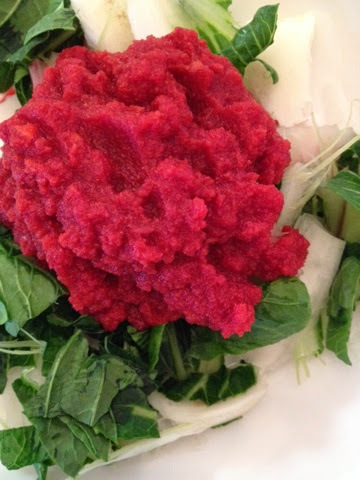 5-minute Carrot-Beet Sauce; Vegan, Gluten-free. Serves one (enough for one salad/pasta dish). 1. In a medium sized microwave safe bowl place your carrots and cover with water. Microwave on high for 2 minutes. 2. 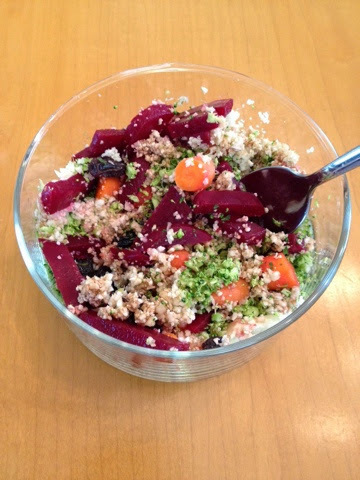 Carefully drain carrots in a strainer and place in mini food processor along with the beets. Process until fully chopped. Add about 1 1/2 T water and blend until smooth. Add more or less water depending on your desired consistency. Serve over pasta, veggies, or use as a dip! Yummy. Holiday Post! : Memorial Day Ice Cream Bars. These Memorial Day ice cream bars are the perfect treat for a hot day! Super simple to make and only 4 ingredients! Definitely a winner! Memorial Day Ice Cream Bars. 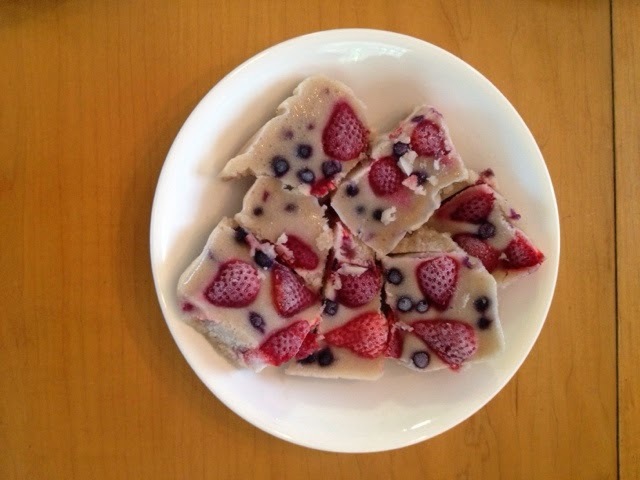 Memorial Day Ice Cream Bars; Vegan, Gluten-free. Makes one serving (one plate of ice cream bars). 1. 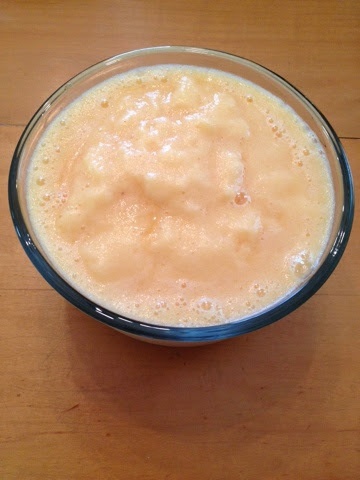 Blend the frozen bananas in your vitamix with the water. The result should be like a thick smoothie. 2. Line a shallow baking dish with parchment paper and pour in banana mixture. 3. Using caution, slice the frozen strawberries in half and squish halves into banana ice cream. Squish in your bloobs as well. 4. Cover and place in freezer overnight. Let thaw about 10 minutes before sliding into bars and devouring! Yumalicious! South of the Border Spicy Tex-Mex Salad. I love my spicy foods! And what better way to get that hot fix than with a SALAD?! This is so simple, so quick, so yummy. A perfect addition to my "Mexican Lasagna"! South of the Border Spicy Tex-Mex Salad; Vegan, Gluten-free. Serves one (makes one "mega salad"). 1. Add the ingredients to a large bowl in the order listed. That's it! Enjoy! I have no words. This sandwich is literally the best thing on the planet. Make it! My Favorite Breakfast Sandwich; Vegan, Gluten-free option. Serves one. 1. Heat a nonstick skillet over medium heat. 2. In a small bowl, mash your banana half. Add vanilla and cinnamon and mix up well. 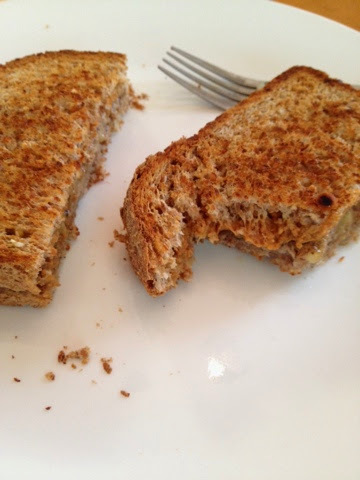 Spread banana mixture on one slice of the bread. 3. 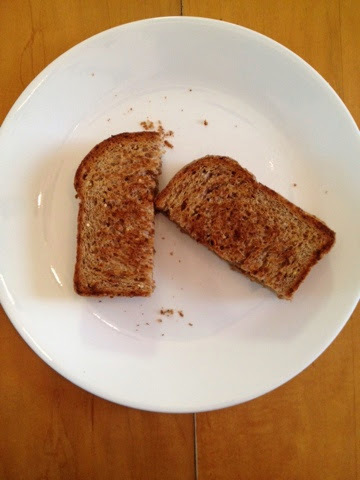 Spread peanut butter on the other slice of bread and smash the two sides together gently. It will be pretty thick, so handle with care. 4. Lay on skillet and cook 3-4 minutes per side, or until desired "grill" is reached (mine took about 4 minutes). Enjoy! 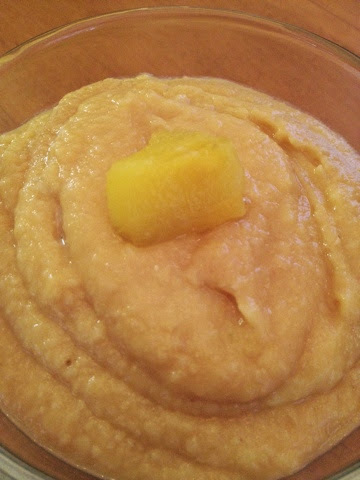 Silky Peanut Butter Pudding; Vegan, Gluten-free. Serves one. 1. 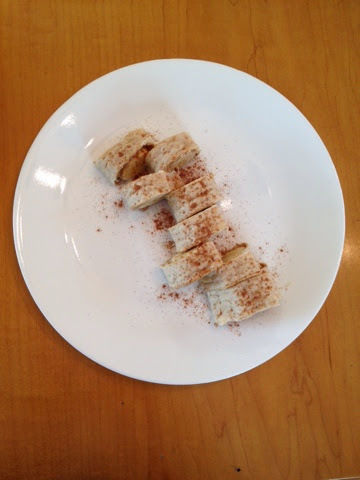 In your mini food processor, combine silken tofu as peanut butter. If you are using a powdered variety, mix it with 1 T water in a so waste bowl BEFORE adding it to the processor. 2. Blend until smooth, scraping sides as needed. Add stevia once blended and blend again to distribute. Burritos. Just the word ignites a passionate love inside of me. I love burritos. As I always say, the bigger the better when it comes to these babies! And boy, this one is big. Really big. Told you it was big. 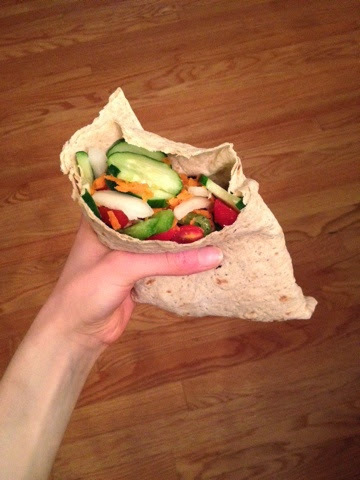 Veggie Delight Burrito; Vegan, Gluten-free option. Serves one. 1. 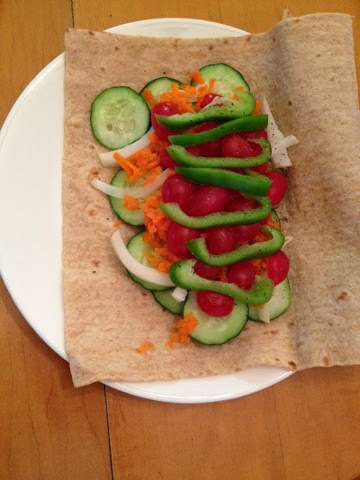 Lay out your wrap and layer on veggies in the order listed. Drizzle vinegar over too and sprinkle with pepper. Done! Eat up! What little kid (or big kid...) doesn't love bubblegum? I know I did. This smoothie totally captures that famous bubblegum flavor. It's quickly become a favorite of mine. Hope you enjoy! 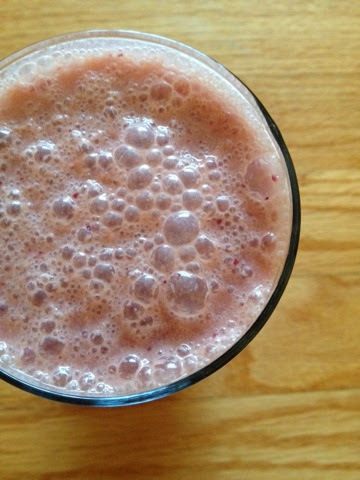 Bubblegum Smoothie; Vegan, Gluten-free. Serves one. 1. Add all ingredients to your vitamix or high speed blender. Blend from low to high. Blend in high speed for about 30 seconds, until grape peelings are almost completely gone. Pour into a tall glass and enjoy! Ok. I love hummus. Like looooooooooove it. It's a definite "go-to" protein option for me, especially when I'm in a rush. 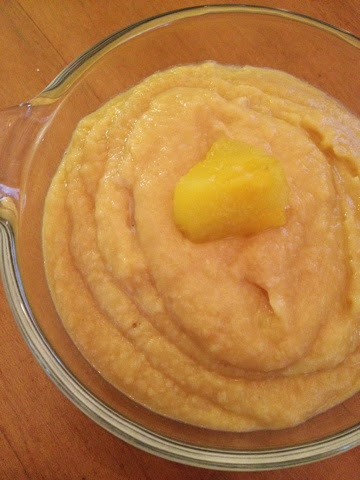 This is probably my all-time fave hummus recipe I've created. Like all hummus recipes, it's super quick and easy, packe with protein, and goes great with almost anything. But this hummus is special. It combines so many of my favorite things it's not even funny! Curious?! You should be. Try this one out--and prepare your taste buds. Flavor bomb alert! 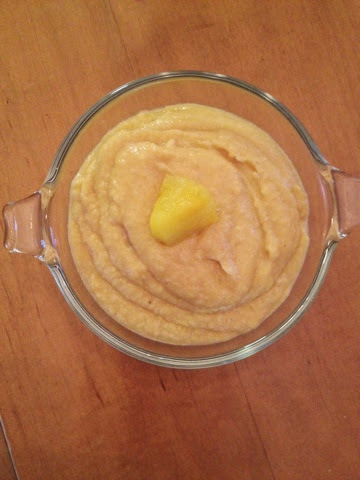 Tropical Hummus; Vegan, Gluten-free. Makes one meal-sized serving (about 1 scant cup hummus). 1. So easy. Combine all ingredients in your mini food processor and blend util smooth. Serve garnished with a pineapple chunk. It's all in the presentation, people! Enjoy! 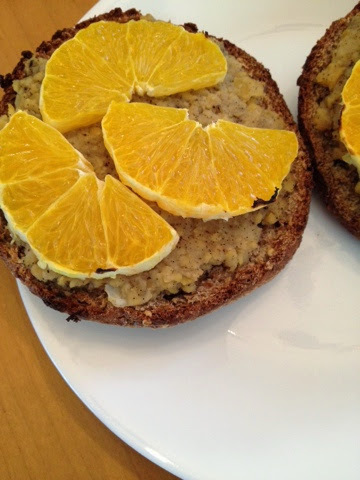 Sunshine Breakfast Sandwich: Orange-Vanilla Cookie Dough. It's a rare thing when I don't want oatmeal for breakfast. So rare, in fact, that before I made this sandwich, I can honesty say I can't remember the last time I DIDN'T have oats for brekkie. What can I say?! I love my oats. Mmm. However, this Sunshine Breakfast Sandwich has easily become a new fave. Super easy to make, nice and filling, and packed with protein, this is a yummy addition to a smoothie breakfast or a mid morning (or afternoon!) snack. Sunshine Breakfast Sandwich; Vegan, Gluten-free option. Serves one. 1. Toast your muffin. I did this in my broiler oven. 2. 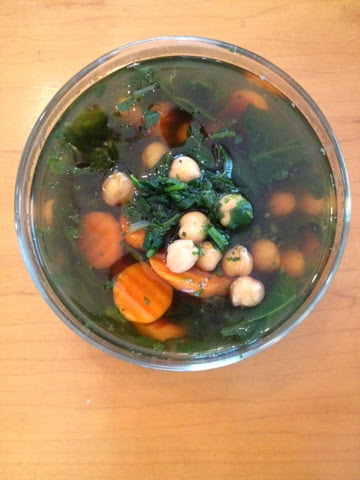 In a small bowl, mash your chickpeas with some water. Add a little at a time to avoid making it too soggy. You want it workable, not runny. Add your vanilla powder and stevia. Stir well. 3. Spread your "cookie dough" on your English muffin toasts. 4. Peel the orange and slice in half, width ways. 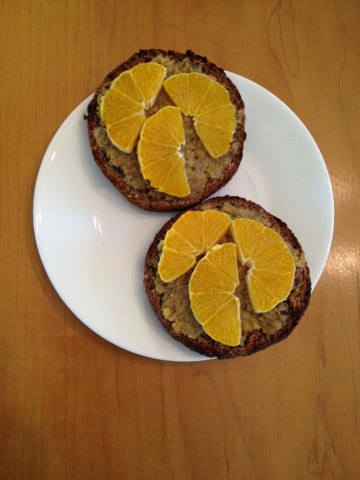 Arrange slices on English muffin, over cookie dough. 5. Place muffin on a foil-covered cookie sheet and broil on high for 3-4 minutes, or until orange is beginning to crisp up. World Famous Cinnamon Swirl Oatmeal. World Famous Cinnamon Swirl Oatmeal; Vegan, Gluten-free. Serves one. 1. 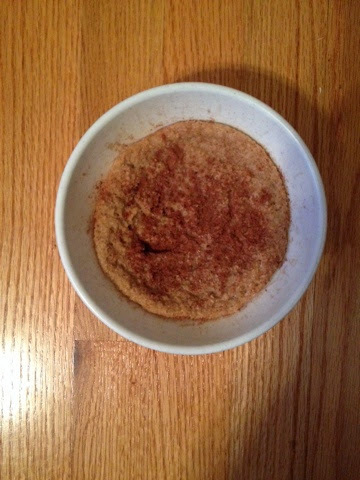 In a medium size microwave safe bowl, combine oats, ge via, and cinnamon. Stir to combine. 2. Pour 1 cup water over and let sit about 5-10 minutes. 3. Microwave on high for 2 minutes. I it looks like it's going to overflow, stop and let it rest for a couple seconds then let it finish cooking. Enjoy! Literal heaven in a bowl. 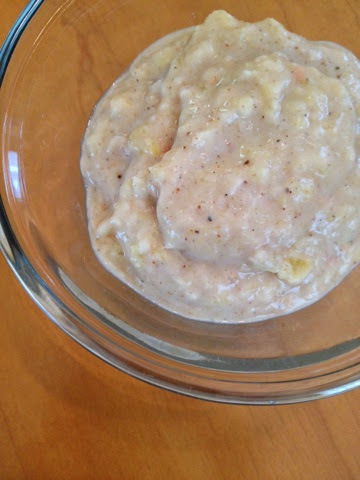 Taste of India White Bean Dip. If you can't tell, I'm on an Indian food kick. My past three recipes have been indian. Oh well. It's my fave what can I say! Well, ONE of my faves. This dip is a great used as a hummus replacement, sandwich spread, cracker topper, or simply by the spoonful! It's so so yummy and as always SUPER simple. Serve this at a party and it's GUARANTEED to be the first thing gone from the table. Enjoy! I served mine with salt-free brown rice snaps. 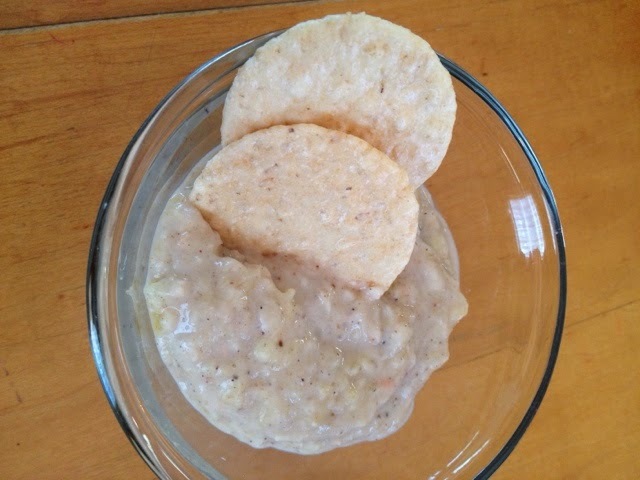 Taste of India White Bean Dip; Vegan, Gluten-free. Serves one (can easily be doubled, tripled, or even quadrupled). 1. Easy peasy. Combine all ingredients in your mini (or regular-sized if you are making a bigger portion) food processor and process until almost completely smooth. You still want a few small mango chunks, so don't completely purée. 2. 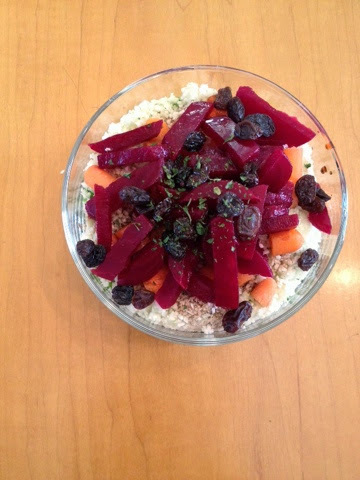 Spoon into bowl, serve with crudités, crackers, spread in a pita-the options are endless! This is a pretty strange recipe, I have to say. I randomly came up with this idea while I was driving. I mulled it over in my brain for about a month, trying to decide if I really wanted to make it or not. You see, half of me thought it would rock, and half of me thought it would be disgusting. Fortunately, the former was true! Go ahead and be adventurous and make this soup. Weird but tasty, I promise! Want it even weirder?! I topped mine with ground flaxseed. Yummers! 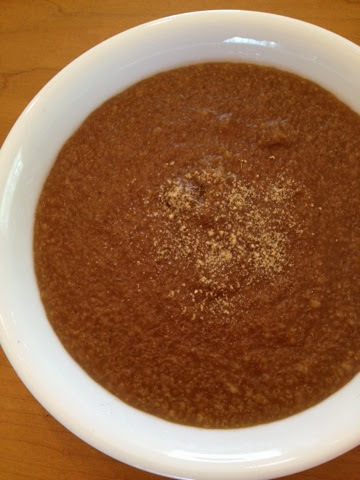 Sweet India Spice Soup; Vegan, Gluten-free. Serves one. 1. Place your tea bag in a moderate size bowl. Pour over the 2 cups boiling water and let steep about 10-15 minutes. 2. Once steeped, squeeze out tea bag and pour tea into a small soup pot. Add remaining ingredients EXCEPT FLAXSEED (if using) and turn heat to high. 3. Bring to a boil, remove from heat and stir, and carefully pour into a bowl. Too with flax if desired. Told you it was weird. This is a great side dish to go along with any indian themed meal. Quick, easy, delicious, and nutritious, this simple yet tasty side dish is the whole package. Coconut Cabbage Curry; Vegan, Gluten-free. Serves one. 1. Heat a nonstick skillet over low medium heat. Add coconut milk with a splash of water until it sizzles. Add cabbage and sauté lightly. 2. Add aminos and curry and turn heat to medium. 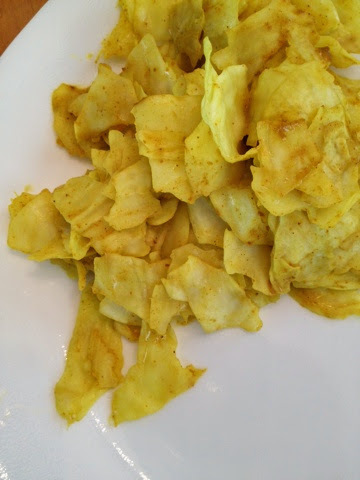 Saue until cabbage is throroughly coated in coconut milk and curry, and liquid is absorbed. Enjoy! To be honest, I was not planning on posting this recipe. I didn't think it would turn out to be a "recipe", really. I was literally just "cleaning out the fridge" when I made this salad. But as I've come to find out time and time again, those "clean out the fridge" salads are often the BEST salads! Hope you enjoy this one! Layers and layers of raw goodness. Another, because it's just so pretty! Ok, ok, last one. Promise. 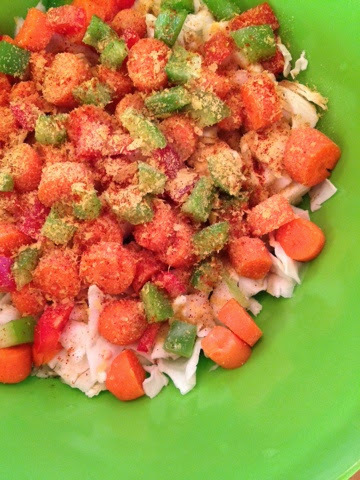 "Flavor of Spring" Salad; Vegan, Gluten-free. Serves one. 1. In your food processor, process your broc and cauli florets. I did this separately to make the "layers". Scoop "rice" into medium size bowl. 2. Top with carrot, then beets, then raisins. Drizzle with balsamic and sprinkle with parsley flakes. Dig in!! 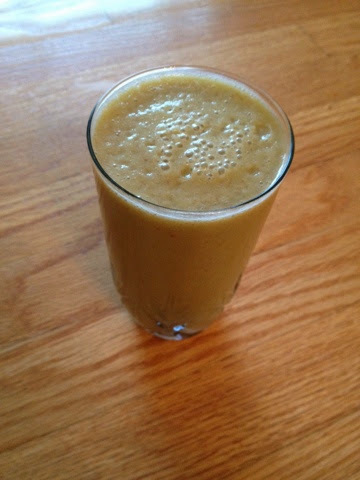 "Salted" Caramel Apple Smoothie; Vegan, Gluten-free. Serves one. 1. Add all ingredients to your vitamix and blend on high speed until smooth. Enjoy! I may or may not have drank this out of the blender...totally acceptable. This is about the easiest recipe in the world. In fact, it's hardly a recipe! But I had to share it anywho. It's super quick and easy, and you probably have all the ingredients right in your kitchen. So what are you waiting for?! 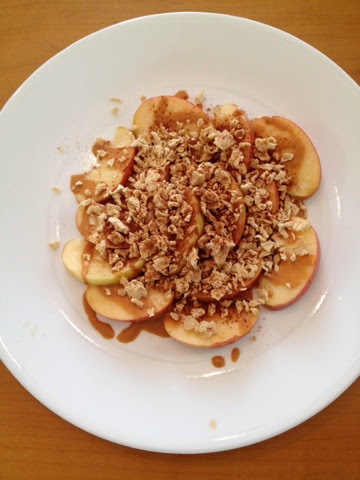 Go make some Apple "Nachos"! Apple "Nachos"; Vegan, Gluten-free. Serves one. 1. Arrange your apple slices on a large plate. 2. Mix your peanut butter and water until combined. You want this on the runny side-think more peanut butter "sauce" than actual PB. 3. 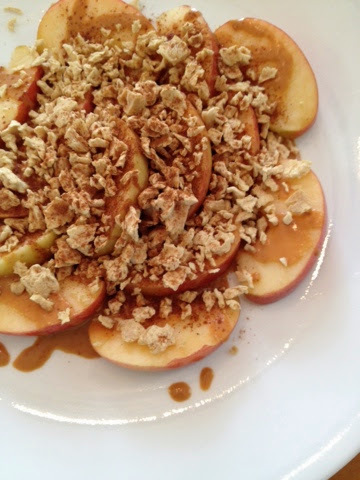 Drizzle peanut sauce over apple slices and sprinkle with TVP granules (DO NOT HYDRATE! Leave them crunchy!) and cinnamon to taste. Enjoy! Mandatory close up, of course! Don't get me wrong, planning recipes is great. But sometimes the yummiest dishes come from simply throwing ingredients together and seeing what you get! This is definitely a favorite of my recipes. 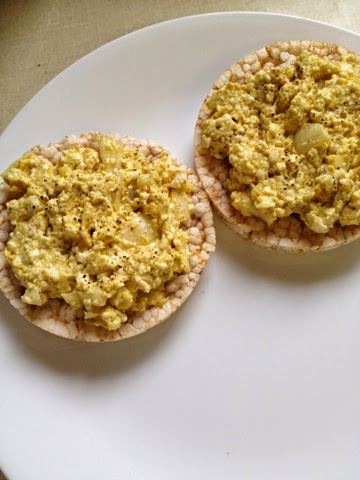 Super quick and easy and packed full of flavor and protein, this Tofu No-egg Salad is great on rice cakes, toast, or simply by the spoonful! Yummy. 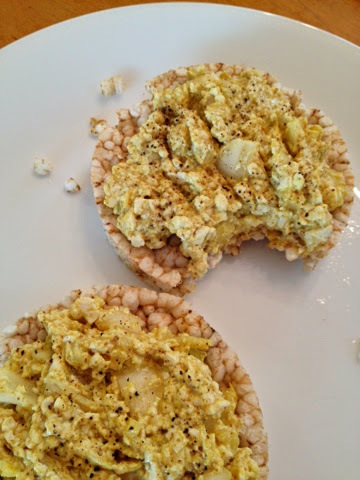 Tofu No-egg Salad; Vegan, Gluten-free. Serves one. 1. In a small bowl, mash together the tofu and mustard. Add spices and onion and mix well. Spread on "vehicle" of choice and sprinkle with black pepper, if desired. Enjoy! Soup is definitely a go-to for me. For example, this recipe was invented after getting home kind of late and simply digging through the fridge to use up what I had left before going to the store. 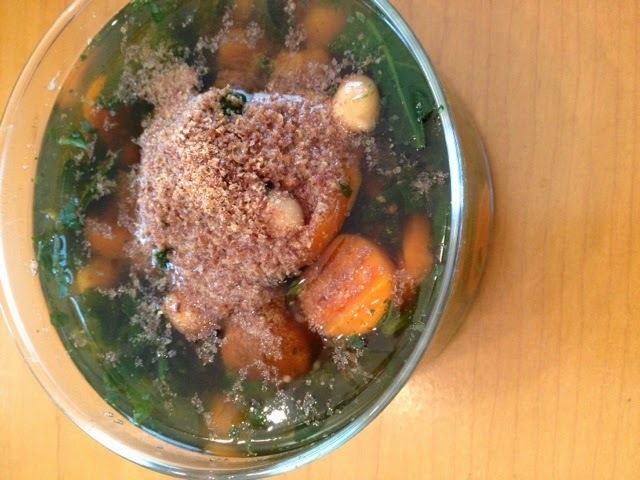 Simple, quick, super yummy and filling, this soup is great for any season and any time of day! Hope you enjoy! 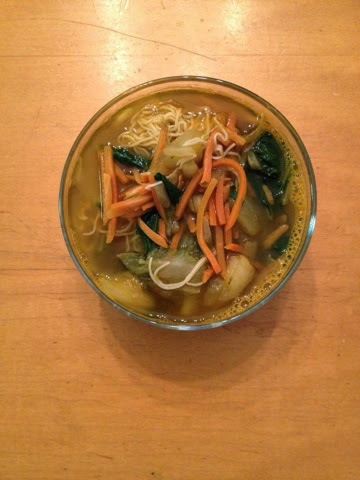 Mighty Miso Soup; Vegan, Gluten-free. Serves one. 3. 3 oz. carrot "matchsticks"
1. This soup is so SO easy. 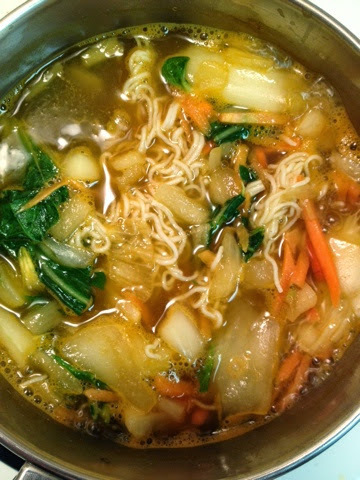 Simply add all ingredients to a medium size soup pot and cook over medium heat until bubbling and until Bok choy, carrots, and onion are tender. Pour ion large bowl and enjoy! I guess this is more of an idea than a recipe. Oh well. It had to be shared! Have you discovered the wonderful vegan protein powerhouse TVP?! I am addicted to this stuff. It's seriously amazing! It resembles ground meat to a tee and can be flavored HOWEVER your heart desires (I've done savory and sweet...both are delish!). The usual way to use TVP is as a groud meat substitute, in chili, tacos, etc., or as I like, simply cook 1:1 ratio TVP to liquid of choice (veggie broth, almond milk, tomato juice, or simply water) and microwave until liquibis absorbed (I do 1 min per serving). This is a bit of an untraditional way to use this, I'll warn you. But fear not! It is sooooo good. You MUST try this. "gRAWnola" with Vanilla No gurt and fresh blueberries; Vegan, Gluten free. Serves one. 1. Prepare your no gurt according to the recipe. 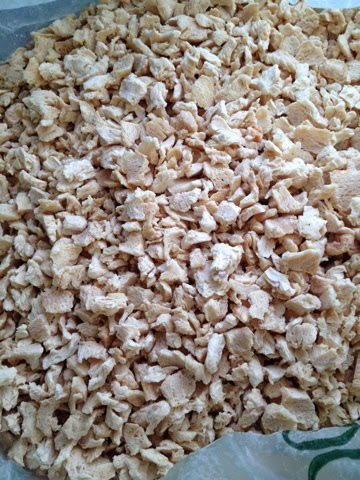 Scoop into a bowl, top with TVP granules (leave them crunchy. TRUST ME!) and blueberries and sprinkle with cinnamon (or other fruits and spices. Get creative people!). Enjoy! And you WILL enojoy this...you will NOT believe how delicious it is! "gRAWnola" with Vanilla No Gurt and Fresh Blueberries. One of my all time favorite sweeteners is blackstrap molasses. In fact, I think of it more as a supplement than a sweetener. This stuf is a total suoerfood, in my opinion. It supplies so much iron it's not even funny. And that taste. Who doesn't love molasses?! 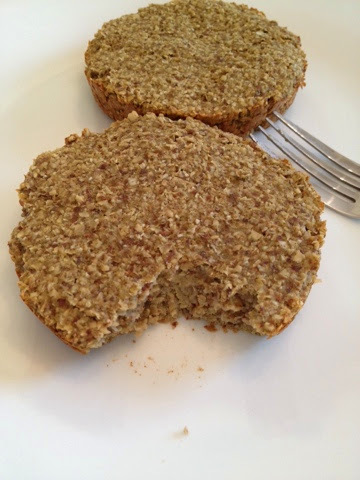 Gingersnap Oatmeal; Vegan, Gluten-free. Serves one. 1. In a small soup pot, bring 1 cup water to a boil. Reduce heat to medium and stir in oats. 2. Cook, stirring regularly, for about 3 minutes or until mostly cooked. 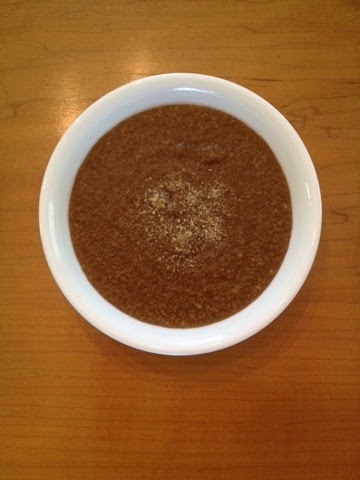 Stir in molasses and ginger and continue cooking until desired thickness is reached. 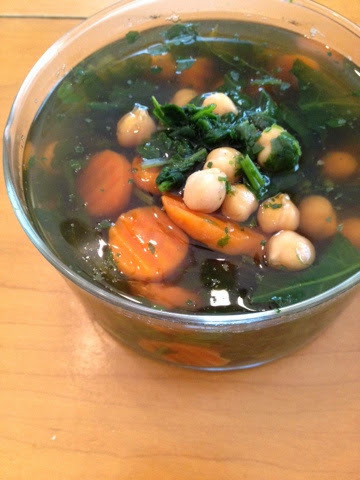 Pour into a bowl, top with ginger, and EAT! This smoothie bowl defines summer. It captures just about every characteristic of "summer food": cool, refreshing, frosty, colorful, melting goodness. Man oh man! This right here is the bomb. Sunshine Super Smoothie Bowl; Vegan, Gluten-free. Makes one "super smoothie" bowl. 1. Place your frozen grapefruit an orange sections in a large strainer. Run under hot water for about 30 seconds. 2. Break apart your citrus sections using your hands, then add them to a vitamix or other high speed blender. Squeeze in your 1/2 lemon and add water. 3. Blend, baby, blend! Increase speed from low to high until frosty thick and perfectly smooth. Enjoy! Are you ready to be bombarded with sala recipes?! When the weather starts warming up, all I want is SALAD. I call my salads "mega salads" because, well, they are freaking HUGE let me tell you. This one is no exception. Packed with yummy fruits (hello antioxidants!) this salad feels like a dessert, thus the name "dessert" salad. But fear not, even this seemingly "treat" of a salad is still 100% guiltless. Too good to be true?! Nope. You love me. Admit it. 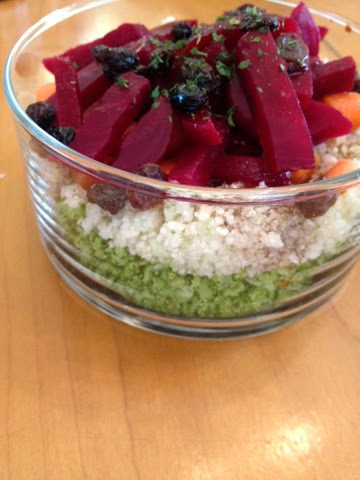 "Dessert" Salad; Vegan, Gluten-free. Served one (one GIANT salad). 1. 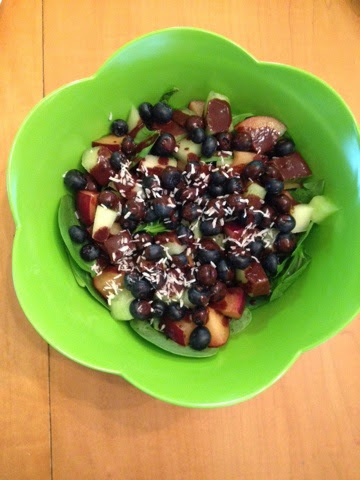 In a gigantic bowl, add spinach first, then plum, honeydew, then bloobs. 2. 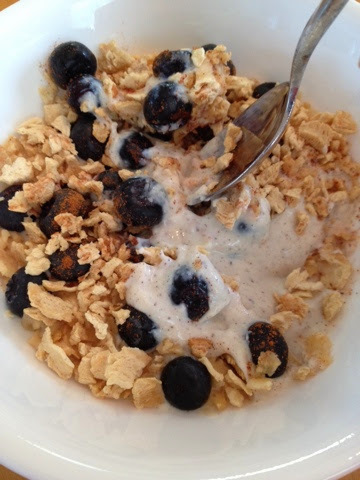 In a small bowl, whisk together the carob and almond milk. Drizzle over salad an sprinkle with coconut shreds. Eat up! 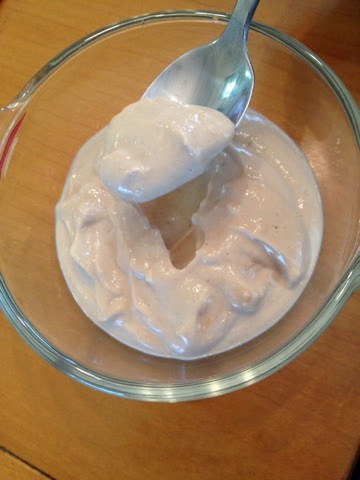 This recipe was inspired by one of my favorite oatmeal toppings/condiments; I call it protein "frosting". This has gotten LOTS of interest and inquiries on my Instagram page, so I thought I would finally share my staple spread on my blog also! Quick and easy, this Breakfast Sushi can go as a quick afternoon pick me up also. 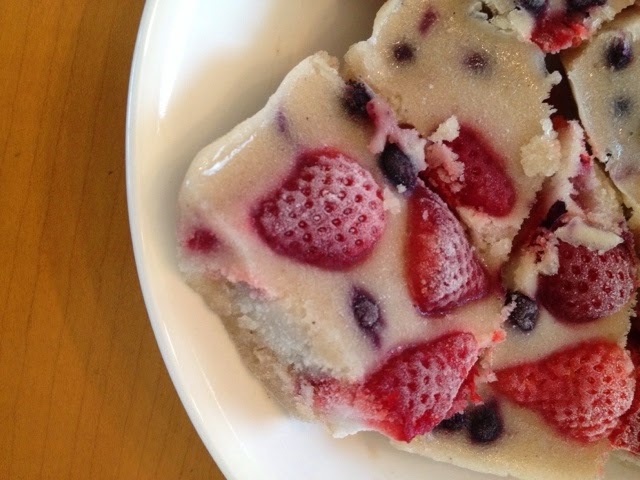 Start to finish, it takes about 5 minutes to make (and it looks really pretty!). Can't beat that! Breakfast Sushi; Vegan, Gluten-free option. Serves one. 1. Lay out your wrap on a large, flat surface. 2. 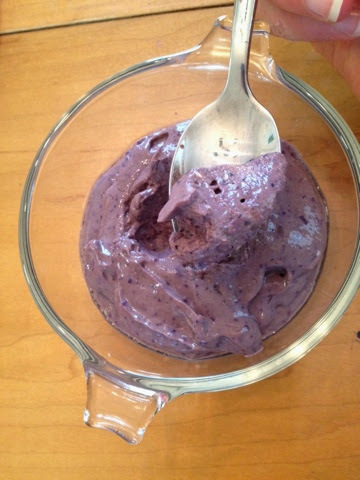 Make your protein frosting: in a small bowl, combine protein powder and optional stevia. 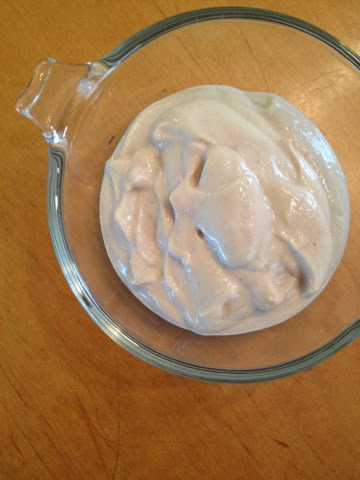 Mix together and add splashes of water until a spreadable, "frosting"-like consistency is reached. Add water a little at a time as it is VERY easy to make this too runny by accident. 3. Spread protein frosting on wrap, reserving a little to seal the edges after you roll it up. 4. 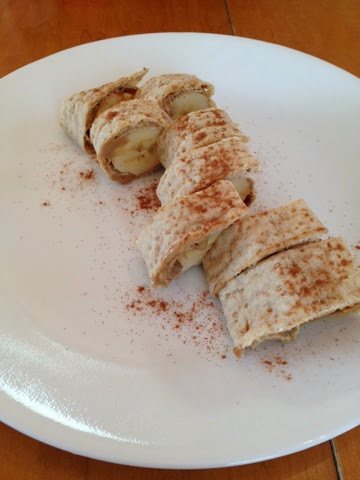 Lay banana to one side of wrap and start Rollin! Seal edges together with remaining frosting, slice like sushi, and sprinkle with cinnamon or ginger. You could try nutmeg too. Get creative! Breakfast in 5 minutes (or less!). Note: what makes this even MORE AWESOME you ask?! Depending on your protein powder, this little meal can pack a BIG protein punch. My wrap plus my powder brought this protein count to 22 grams total. Boom babay! Holiday Post! : Mexican Stuffed Poblano Pepper. Holiday Post! : Lemon-Lime "Zinger" Smoothie.